In a 1915 Prairie house in St. Paul, an addition designed by Joseph Metzler of SALA Architects fixed headaches caused by the isolated old kitchen. 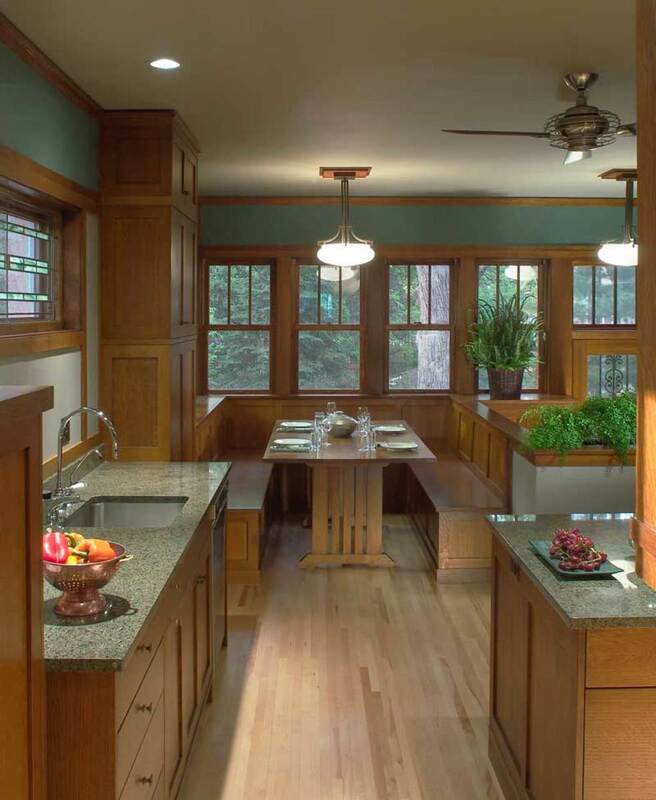 By now you may be aware that original kitchens of the Arts & Crafts period (1901–1925) were very utilitarian: smallish spaces outfitted with white tile and painted cabinets. Many of today’s owners have taken to heart the advice to “keep it simple” when remodeling, especially if the kitchen remains in the original footprint. It’s also the thrifty approach. 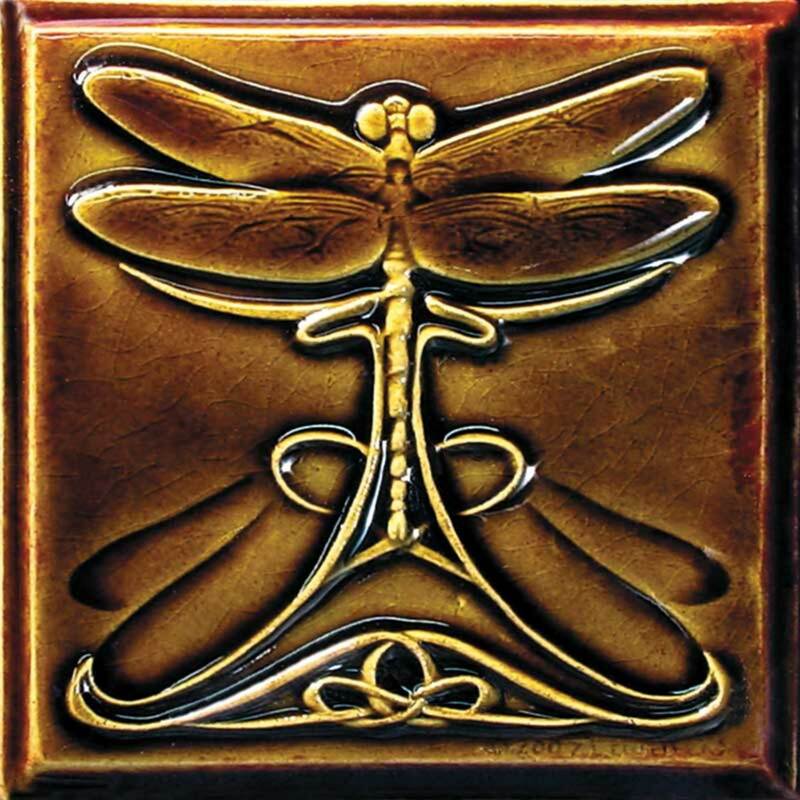 Lewellen’s original ceramic tiles feature such motifs as dragonflies. 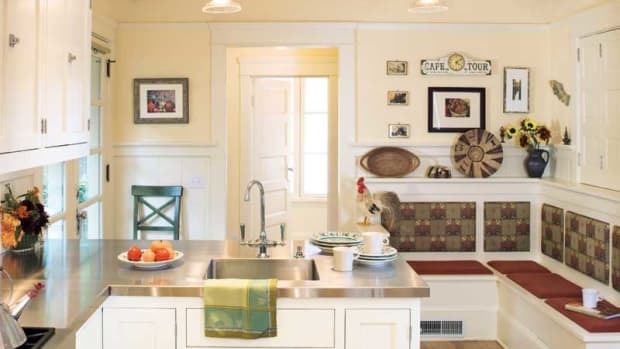 So, if you are adding on or extensively remodeling—or building a revival house—you may choose to design a more “finished” kitchen. 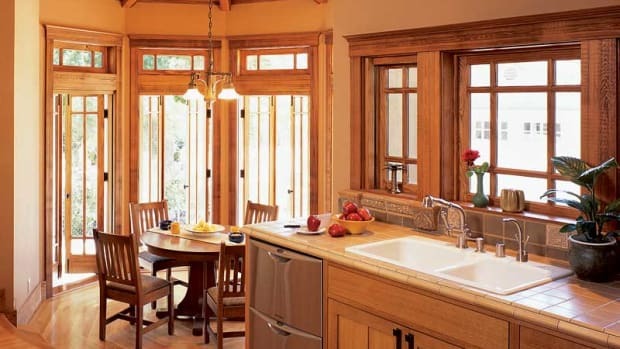 Arts & Crafts revival kitchens often have furniture-quality cabinets accented by art tile, handsome light fixtures, forged and cast hardware, and decorative textiles. 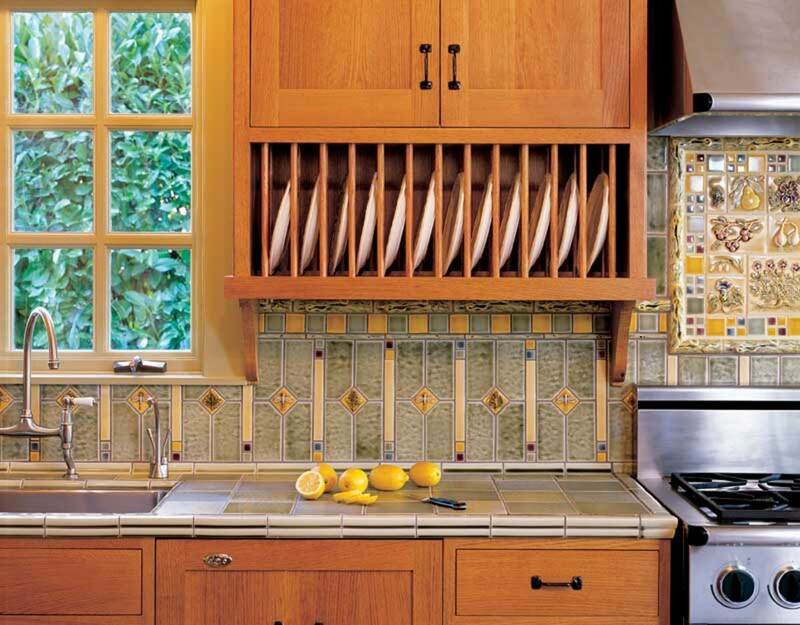 Tile backsplash by Pratt & Larson. Dishwashers and fridges hide behind custom cabinets; the microwave oven is tucked into a pantry; the stove has retro styling. Cooper explains that a more interpretive approach acknowledges the presence of modern appliances and light ing, but within a room that incorporates period materials (Douglas fir, soapstone) and detailing (window trim, brackets). There’s a fair amount of crossover; you might install a modern cooktop in a granite counter, but diminish the modernity by adding a hand-hammered copper vent hood right out of the period. Watch the scale; before you assume you need to add on, try borrowing space from a back hall or pantry and keep to the original footprint. Any additions should be proportionate to the house; sometimes just a bump-out of a few feet, with windows for extra light, is enough. The room will have a more timeless look if details are borrowed from other historic kitchens, or from the pantry or back hall—rather than copied from high-style elements in the dining room. (Remember, too, that a simple kitchen is easier to clean!) 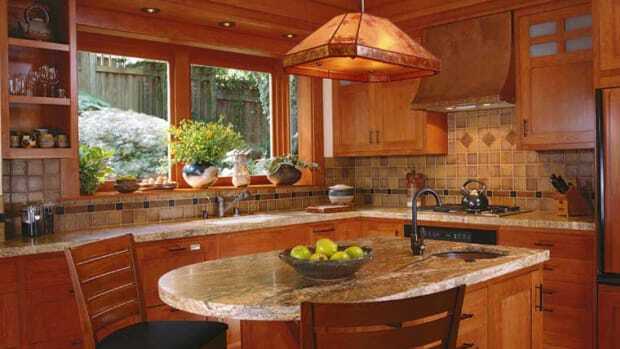 Consider using several different counter surfaces, which is historical as well as practical. All of these tips work for bungalows, American Foursquares, Tudors, and the era’s Colonial Revival homes. 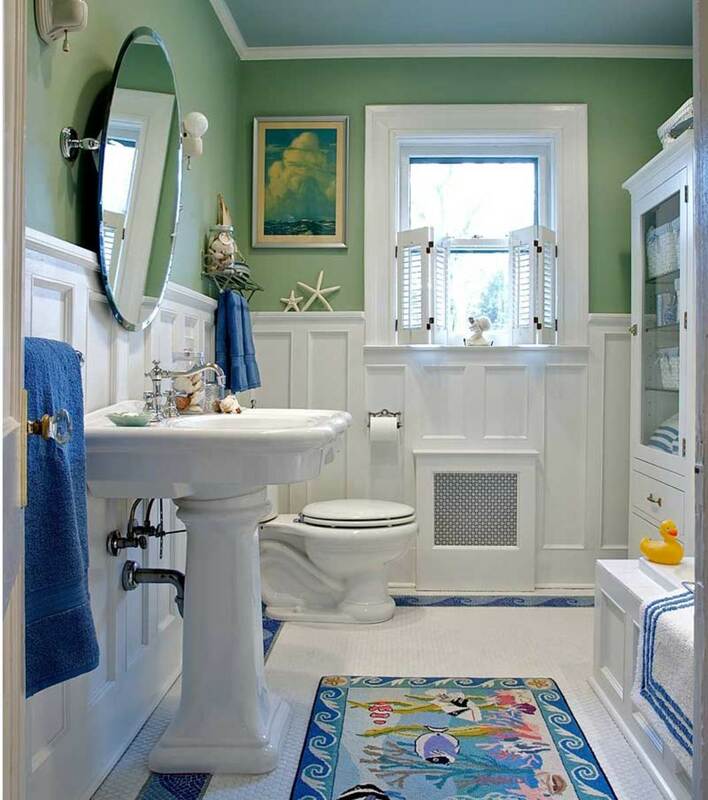 This “sanitary” white bathroom designed by Carisa Mahnken edges toward cottage style with a wood wainscot, extra color, and a whimsical wave border in the tile floor.